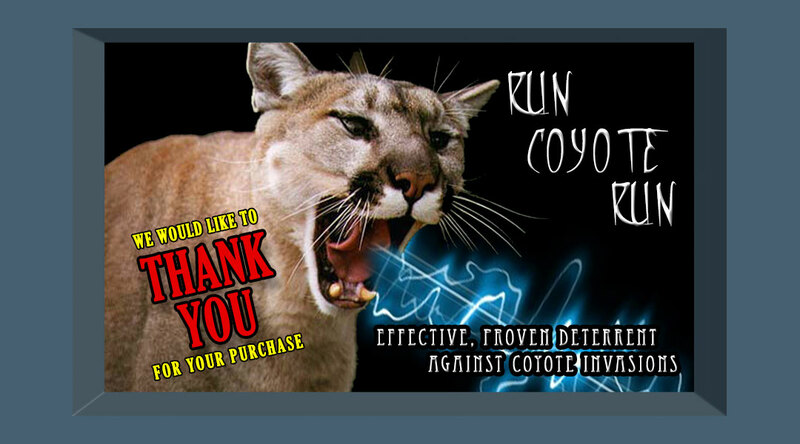 Thank you for purchasing a Run Coyote Run CD. Here we’ve listed some questions that people have asked us since we started offering these CDs. If you have a question that you don’t see listed here, please feel free to contact us at info@runcoyoterun.com. We wish you success with using our CD and hope that you have the same degree of success and security that we and many of our customers have had. “Can the CD be heard by humans? Yes, this CD can be heard by humans. The volume is set based on your output device, but we usually recommend that it is played with at least a medium volume to be certain that the coyotes hear the sounds. You could make the CD as low or as high as you like. With coyotes having superior hearing to us humans, it’s entirely possible that a volume level that’s low enough not to annoy your neighbors might be perfectly effective at keeping the coyotes at bay, but we don’t have any experience with people using the CD at a deliberately low volume. Most of our customers live on larger, ranch-style properties. What I can say is that using the CD in any capacity has to be better than not using it at all. I’ve had a customer write us and let us know that their power went out a few weeks back and since the CD player couldn’t auto-restart it wasn’t playing. No one noticed until a coyote showed up on their property the next afternoon. They were going to write me a very different email until they realized that the CD had stopped playing due to the power outage. Now they’ve actually ordered another CD to use on the other side of their property for improved coverage. We have 5 dogs (2 of them very territorial), 2 horses, 4 cows and 17 cats living on our property. The cats completely ignored the CD after being mildly startled once or twice. The dogs reacted with curiosity but once they decided that nothing was going to come out and pounce on them they ignored it as well. The cows and horses are not disturbed by the sounds, but do tend to avoid the areas covered by our output devices. It all depends on your needs and the size of your property. If you have a larger property, then we recommend increasing the field of coverage, either with a higher volume or additional audio devices and CDs. We have 2 CD players running 24 hours a day, one by our pool (where 2 of our 3 cats were taken) and one on the opposite side of the property where we have seen coyotes. We already had power running to our pool area, so we just put the CD player in a bag to protect it from the rain and plugged it in. For the other player, we used a 100’ extension cord and the bag wrap. We’ve had several big rains since we started using these and haven’t had any problems. We suggest placing your speakers or CD players as close to the areas you’ve seen your coyotes as possible, with the obvious restriction being access to wiring and/or power. In addition, you want to be sure to conceal your device as well as you can, as our research indicates that coyotes may be able to discern the artificial nature of the deterrent after a time if the player/speakers are in plain sight. Some examples of this concealment would be placing your player in a bush, beneath a 1/2 barrel, on an enclosed porch beneath a piece of furniture, up in a tree, etc. We have 2 players, and keep one of them beneath a 1/2 barrel under a tree and within some foliage, and the other in a screened-in gazebo under a wicker couch. The general idea is that if a cougar could hide where you have your speakers/players placed, then you’re probably in good shape. Both of our players are also wrapped in plastic to protect them from the elements. Our players run 24 hours a day. The sounds may be a little distracting at night initially, but after a few nights they didn’t bother us at all. My hunter friend who helped me research and create this CD said that playing it during the day is just as important as playing it in the evening, because the coyotes come during the day to ‘scout’ the area and then often return at night or sunrise/sunset to strike. As for whether to play the CD through the colder months, we intend to it run ours 24/7, 365 days. Coyotes are year-round hunters and while they may seem less visible in the winter months, we’re not willing to take any chances. Based on our research, and before we created and started using the Run Coyote Run CD, we tried hanging pots and pans that would ‘clank’ in the wind, safely firing a shotgun 2x a day and.. how do I put this delicately? Marking the perimeter of our property the natural way. None of these solutions worked for us, and after we lost another cat, we started on this CD. We haven’t seen a coyote since we started using it, or lost any more cats, so we feel very good about its effectiveness. A sound should occur on the CD every 5-7 minutes, with total silence between each sound. According to our research, having sounds occur more frequently would give the coyotes a chance to focus on the source and possibly realize that they’re being duped. Sometimes the sounds is a shorter growl that lasts only a second or so, and sometimes it’s a longer, lengthier sound. We test each disc before we ship it, and verify that the play length of the disc is 80 minutes, and that the sounds are present. WE'RE SORRY, NO REFUNDS OR EXCHANGES. FREE SHIPPING APPLIES ONLY IN THE CONTINENTAL U.S. WE DO NOT SHIP INTERNATIONALLY. SHIPPING IS VIA USPS. DUE TO CHANGES AT THE USPS WE UNFORTUNATELY NO LONGER SHIP TO CANADA. ALL ORDERS RECEIVED BEFORE 3PM CENTRAL WILL SHIP PROMPTLY THE FOLLOWING DAY.